It’s October! My favorite month, and my favorite holiday, Halloween! (It’s also my birthday, which might have something to do with my enthusiasm.) I think Halloween is the most creative holiday of all; as a child, I spent hours brainstorming and making my home-made costumes, cooking and pumpkin carving. 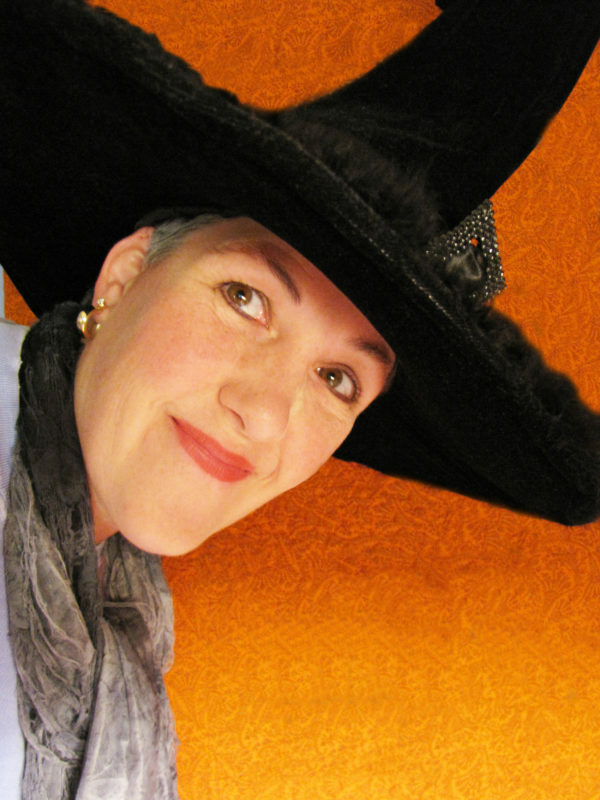 These days, I love decorating my home for Halloween, baking spooky goodies, and preparing to greet the trick-or-treaters in my witch’s hat. Halloween is also about community; it’s a time to meet your neighbors and celebrate autumn’s bounty. 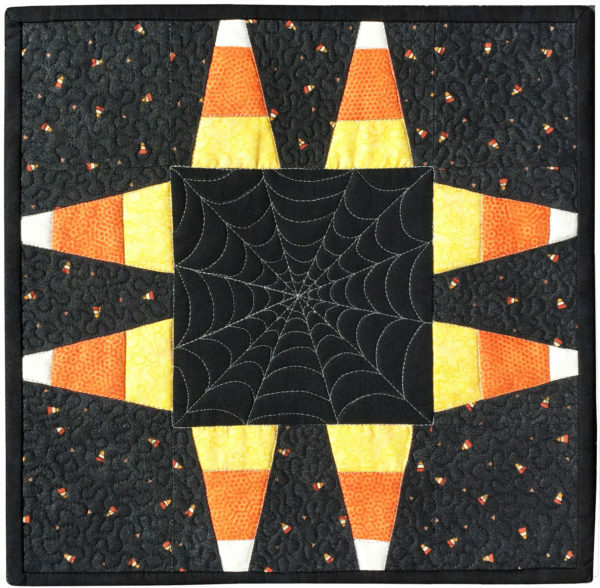 And best of all, Halloween is about CANDY! Here’s an easy project to satisfy your sweet tooth…without any calories at all! 1. 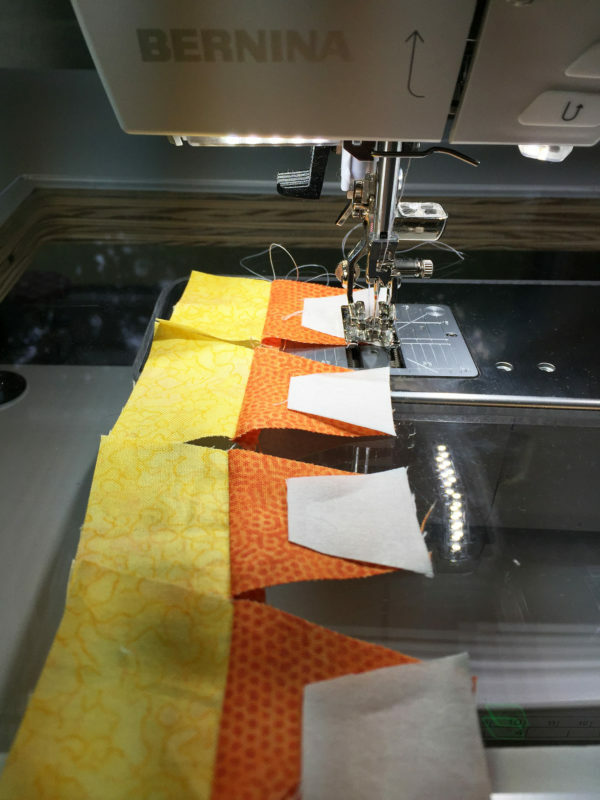 Print out the pattern page, and check to make sure that the sizes on your printout match the sizes on the pattern. (Printers sometimes slightly shrink printouts.) Cut out the pattern pieces. 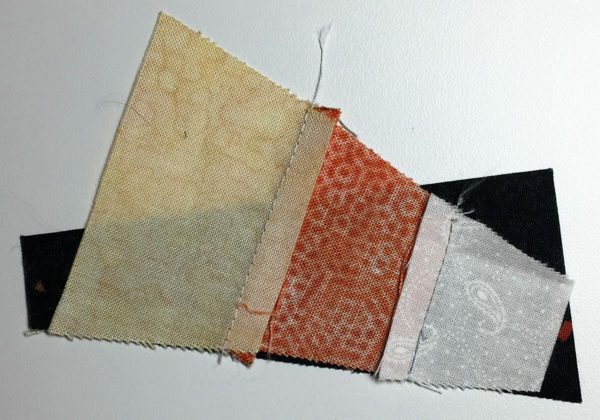 For sturdier patterns, consider printing or tracing them onto card stock. The pattern page also contains construction diagrams. 2. 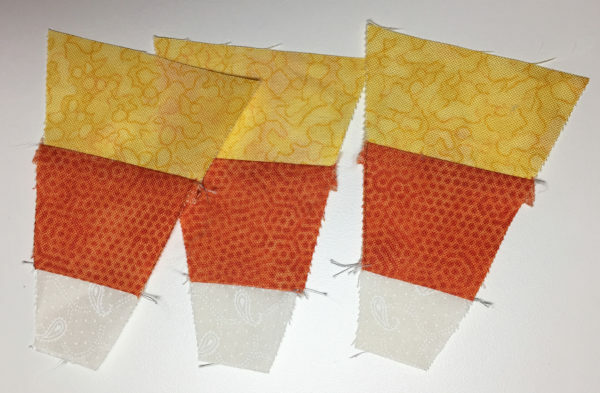 Trace around the patterns onto your fabric strips, and cut 8 C pieces from the yellow strip, 8 B pieces from the orange strip, and 8 A pieces from the white strip. 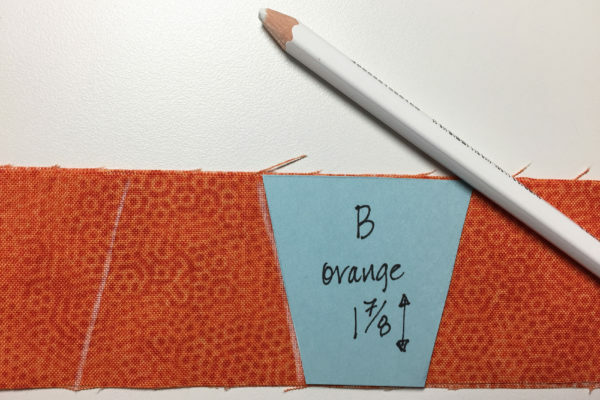 Alternately flip the patterns upside down (as shown below) to use your fabric most efficiently. 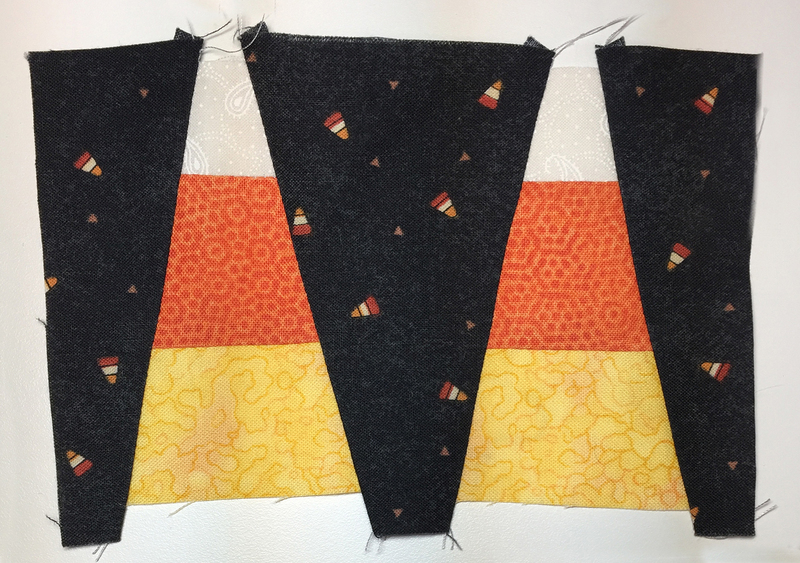 For the black backgrounds, cut 4 E pieces, 4 D pieces, and 4 reversed D pieces from the black print strip. 3. 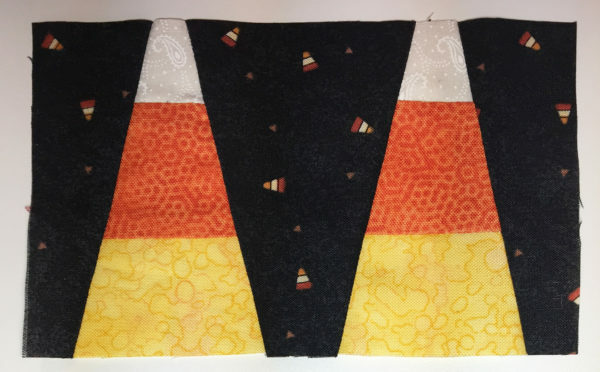 Piece the candy corn. Attach Patchwork foot #97D and engage the Dual Feed. Align the top of the yellow C units with the bottom of the orange B units, right sides together, and sew together with a 1/4″ seam. Note that the orange piece is slightly wider than the yellow; center it on top of the yellow. The fabrics line up at the point where the 1/4″ seam is sewn, and not at the top. 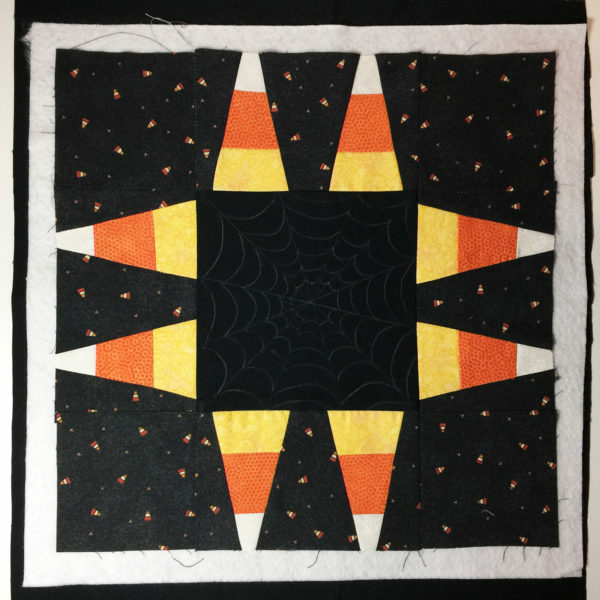 I used 50-weight gray Aurifil cotton thread. Lightweight thread is great for piecing because it does not add extra bulk in the seam allowances. 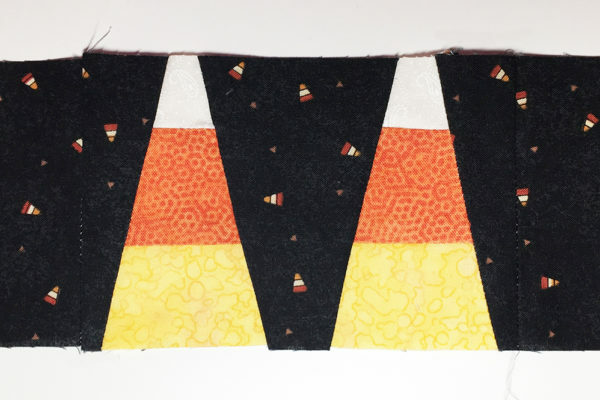 TIP: The fastest way to sew all eight candy corn units together is by “chain piecing,” where you line all the units up and sew them together one after the other before cutting the threads. 4. 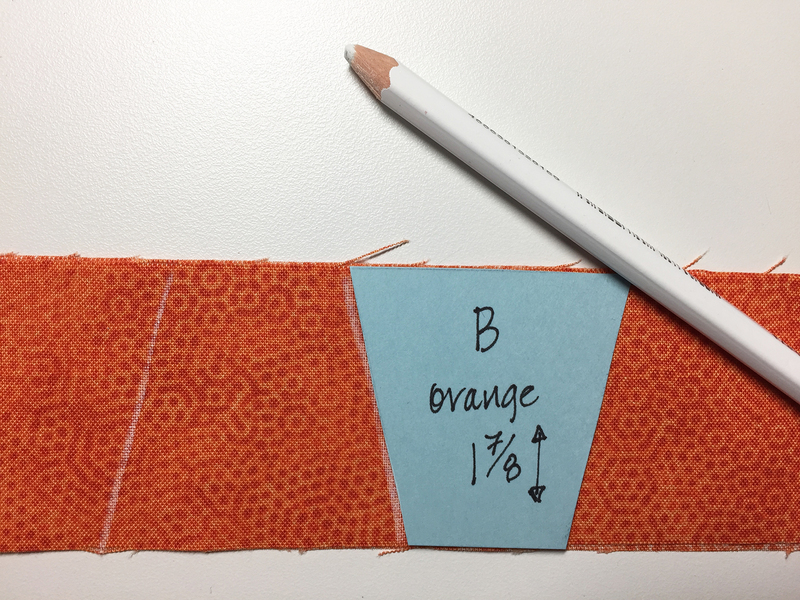 Align the top of the orange B units with the bottom of the white A units, right sides together, and sew together with a 1/4″ seam. Note that the white piece is slightly wider than the orange; center it on top of the orange. 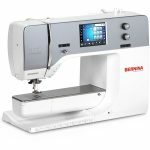 The fabrics line up at the point where the 1/4″ seam is sewn, and not at the top. 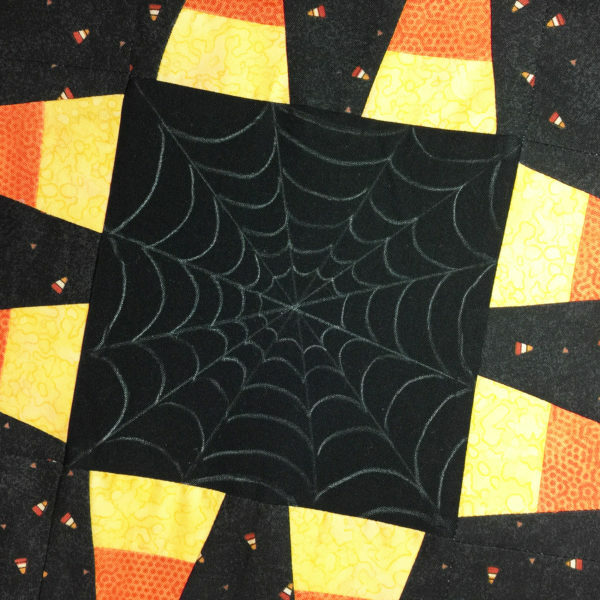 Again, chain piecing will help you do this more quickly and efficiently. 7. Sew the pieces together as you have arranged them. The black print D and E pieces are slightly longer than the candy corn units to make it easier to trim. Center the candy corn units on top, right sides together, (with an equal amount of the D and E units hanging off on each side) and sew them together with 1/4″ seams. 9. Trim and square up the side units so that they both measure 3-1/2″ x 5-3/4″. 12. 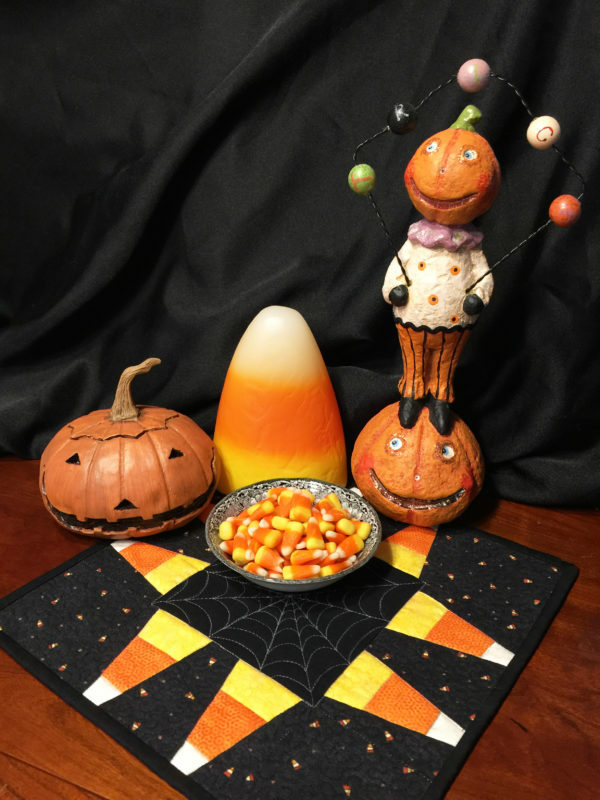 Sew these two units to the top and bottom, taking care that the candy corn points are facing out. 16. 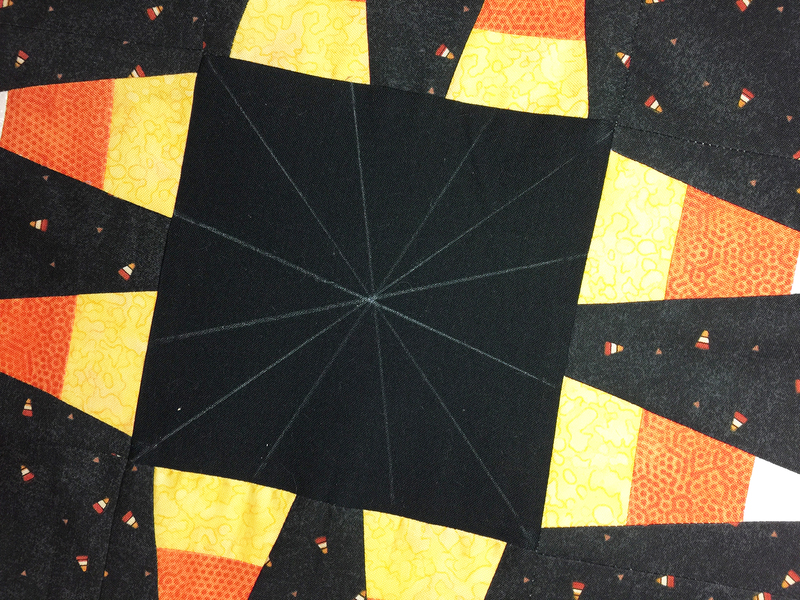 Pin baste, and free-motion machine quilt. 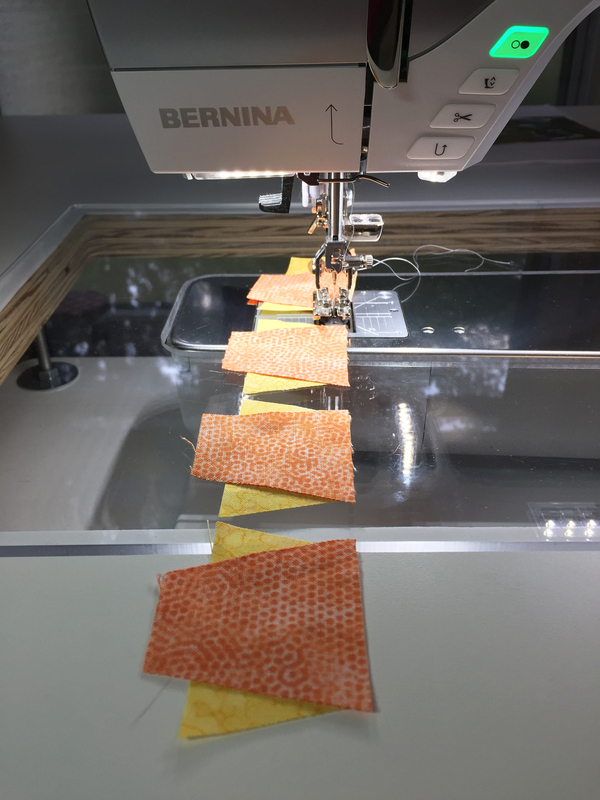 My favorite foot for free-motion quilting is #15, a large metal oval. Make sure to drop your feed dogs! I used medium gray thread on the spiderweb, around the candy corn and between the candy corn sections; and black thread for a small meander on the black print. 17. 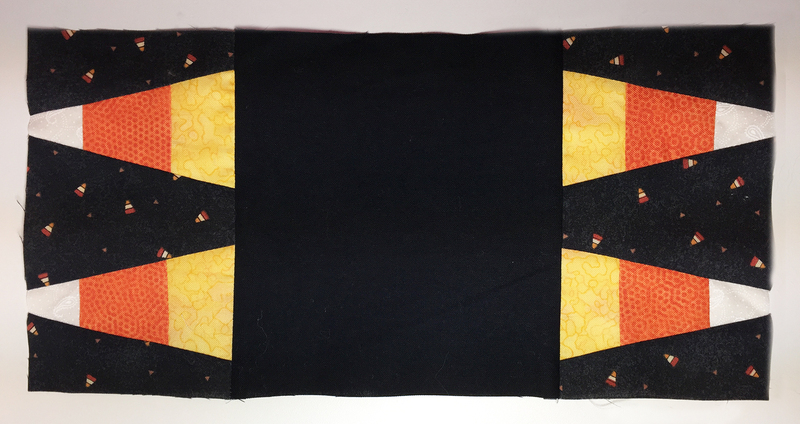 Bind the quilt: The 2″ x 50″ black strip makes a narrow double-fold straight-cut binding. 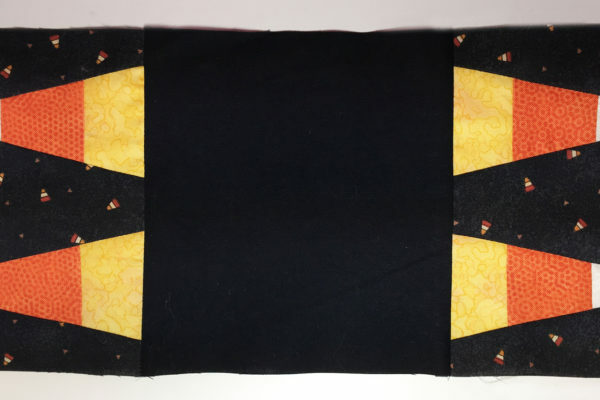 For a great binding tutorial, look here. Previous Previous post: Will it Sew Through all the Layers?